Myths and facts for the perfect match. We are constantly barraged with information about camps from headline news and magazines to e-mails and conversations on the sidelines at Little League games. As such, sometimes it’s hard to separate fact from fiction. But, you’ll want to know what’s true and what’s not as you answer the all-important question, “What should I do with my kids this summer?” To guide you, I’ve compiled a list of myths versus facts about the camp experience. Fact: It is tempting for us, especially former camp enthusiasts, to recreate our own camp experience for our kids. While the saying “mother knows best” is true in most circumstances, some input from your child is the optimum approach when choosing a camp. Maybe you think an all-boys camp is the best place for your son. But, he may want the opportunity to make friends with girls in a relaxed setting. You may think your daughter desires a camp that specializes in art and drama because that is what she enjoys. However, maybe she wants to improve her tennis game this summer. Find out if your child wants to build on existing strengths and interests or try something new. Be open to the unexpected! Fact: Sometimes it is the parent who sets a child up for an overnight camping failure by suggesting things like “I will pick you up if you are unhappy” or “Let’s try this camp for one week to see how it goes.” Kids need a chance to feel homesick and get through it with the help of counselors and individual coping mechanisms to feel successful about a camp experience. One week barely gives a child a chance to find his or her way around a camp, much less feel the tinge of missing mom and dad— or the family dog. A two to four week introductory session, however, allows kids to be immersed in the daily routine of a new and safe place, build friendships that will carry over until the next summer and enjoy the success of doing something totally by themselves. Do the research and be comfortable letting go. Myth: A specialty camp rather than a traditional camp is the ideal place for my child. Fact: Specialty sports camps focus on teaching technical skills, not necessarily life skills. A child goes to this type of program to work on the skills for one sport, art form or discipline like drama, rather than to be part of a community found in a traditional camp. Also be mindful that a specialty camp may not necessarily provide counselors to take care of a homesick child. The coaches and instructors at specialty camps are generally there to teach skills, not to help your child to make friends. Therefore, I usually recommend younger kids attend specialty programs with a buddy. Fact: What outwardly seems to provide a safety net has its pitfalls. A pal can sometimes act as a barrier to your child’s making new friends. All too often, one of the campers has a difficult time. The other child then feels responsible for the friend, making the relationship burdensome at camp. In addition, your child may choose activities based on her mates’ interests, rather her own. It is important to weigh the comfort of going with a friend to camp against the possible drawbacks. 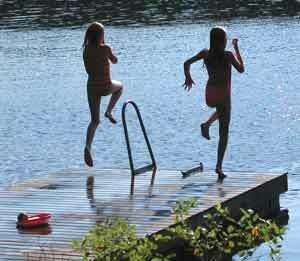 If going with a companion is the only way your child will try camp, it might be worth it. Just prepare your child with possible scenarios and provide her with appropriate problem-solving strategies. Fact: The truth is that there is a camp out there to fit every budget. If you plan ahead, you can take advantage of early enrollment discounts and financial aid. By applying early, it is possible to get a 20 to 50 percent discount off of camp tuition based on need. As private camps tend to be more expensive, if you’re on a tight budget consider camps run by your local county government or agencies, such as the Campfire Boys and Girls, the Jewish Federation, Boys Scouts and Girl Scouts, the Jewish Community Center and the Salvation Army. Lastly, inquire about shorter sessions and discounts for multiple children from one family. Fact: While it is a nice break for some kids to fish and hike at camp, others just want to partake in athletics. I advise parents to look for a camp that provides the sports that the child likes, plus new challenges that the parents might want for him or her. Summer sports are far different from sports during the school year. There is less of an emphasis on winning. A child who cannot make the select baseball or soccer team at home may shine in a camp environment. In addition, there are no helicopter parents hovering over kids or yelling on the sidelines at camp. One camp director told me that at the beginning of each session, campers focus heavily on sports because this is how they are comfortable socializing. Yet, by the middle to end of the session, the kids are more comfortable taking risks, both athletically and socially. Whether it is up at bat or on the boat, sports-related camps hire counselors who serve as role models to teach qualities, like good sportsmanship, teamwork and learning to lose gracefully. Myth: My friend is the greatest source for camp suggestions. Fact: While your friend may be adept at her own child’s experience, camp advisors visit hundreds of camps each summer. Camp advisory services have years of experience addressing families’ questions and concerns. Advisors ask families the questions necessary to make sure the fit is right between the program and the child and provide families with a list of questions to ask directors about potential camps. Many of these services are free, helping families to gather information, compare programs, and obtain references and feedback from past participants. The breadth of information an advisory service can provide is invaluable. When the time comes for choosing a camp, there are a thousand questions to ask. But, it is important to ask the ideal questions and get the facts to find the right camp for your child. Once you have done this, the investment provides your child with a lifetime of rewards. Eve Eifler is a consultant at Tips on Trips and Camps of Baltimore, Maryland, one of the oldest and largest camp advisory services. With advisors in 16 cities and relationships with more than 600 sleepaway camps and programs, the service provides advice and guidance to thousands of families each year by phone, e-mail and the website. For more information, to request brochures and DVDs, or to speak to a consultant, visit www.tipsontripsandcamps.com.